SACRAMENTO -- At the end of the 2014 season, Allie Will gave up a promising pro tennis career after only two years on the circuit. In her last singles match, the former University of Florida star lost to No. 376 Jasmine Paolini of Italy, 7-6 in the third set, in the first round of qualifying in the $50,000 Tennis Classic of Macon (Ga.). "I couldn't afford it," Will, a 25-year-old Fairfield resident, lamented Sunday. "Financially, it was really hard for me. I was kind of living week by week, and I think that was adding a little too much stress and took the fun out of the game for me. I rolled my ankle and was going to be out a little bit, I wasn't enjoying it as much, so I thought I'd go back and finish my education and go from there." Will didn't play in a tournament for 2 1/2 years (other than reaching the doubles quarterfinals in a $10,000 event in Gainesville, Fla., where the University of Florida is located, in March 2015). Last weekend, Will finally succumbed to the urge to play -- albeit at a much lower level. Seeded No. 1, she defeated No. 3 Muskan Mahajan, an impressive 14-year-old from San Ramon, 6-2, 6-1 Sunday to win the women's open title in the $2,500 Rio del Oro Open/Senior/NTRP at the Rio del Oro Racquet Club. Will lost only six games in four tournament matches. "It was just exciting to be out on a tennis court again after (2 1/2) years of not playing," said the 5-foot-10 (1.77-meter) Will, who did not play doubles. "It's just fun to be out here competing, and to end up with (the title) is exciting." in a matchup of teenagers for the men's open singles title. Meanwhile, two junior stars met in the men's open final. No. 2 seed Jenson (J.T.) Brooksby, 16, of Carmichael wore down No. 4 Andrew Ton, 17, of Milpitas 6-4, 6-1. 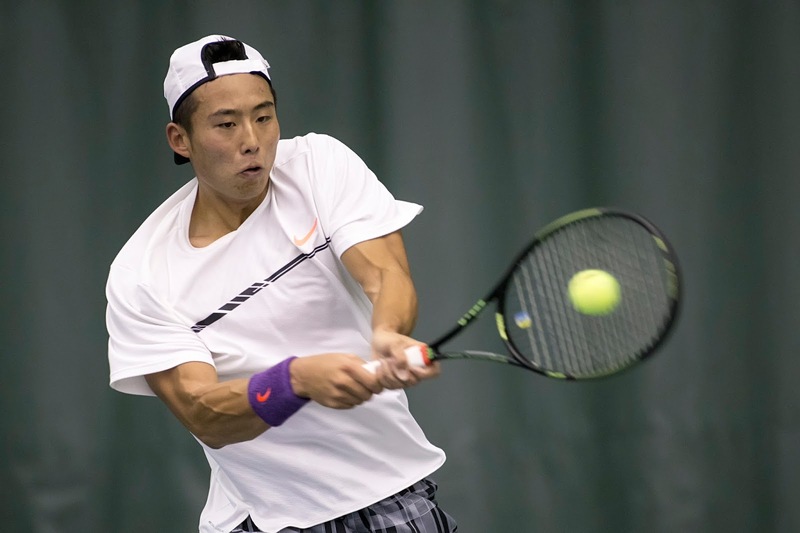 Brooksby reached the boys 16s singles final in the USTA National Championships in Kalamazoo, Mich., last August, and Ton won the 16s doubles title with Maximillian Wild of Murrieta, Calif.
Brooksby is ranked second nationally in singles in the 16s. Will was born in San Mateo, grew up in San Carlos and moved to Boca Raton, Fla. After playing No. 1 on Florida's 2011 and 2012 NCAA championship teams, she gave up her senior year and turned pro. Will reached career highs of No. 280 in singles and No. 98 in doubles. Although she did not win any singles titles, she advanced to the final of the $25,000 Redding Challenger in 2012 and the semifinals of the $50,000 Sacramento Challenger in 2013. Will collected 11 ITF (minor-league) crowns in doubles. After earning a telecommunications degree at Florida, Will moved back to Northern California, where most of her family lives. She teaches at the Cello International Tennis Academy (CITA) in Fairfield. Will said she has no plans to return to pro tennis. But she doesn't rule it out, either. "I'm just trying to take it one day at a time, just trying to make sure I'm in shape," Will said. "If I really want to make that happen, I have to make sure my game is ready and I'm in the best shape I can be. Since getting older sometimes makes things harder, you have to make sure you take care of your body first." Brooksby, who has grown to 5-foot-9 (1.75 meters) and 135 pounds (61.2 kilograms), already has begun playing in professional tournaments as an amateur. He came within a tiebreaker of beating Argentina's Marco Trungelliti, ranked No. 153 in the world at the time, in the second round of qualifying in the $100,000 Stockton Challenger last July. Brooksby also qualified for $25,000 Futures tournaments in Berkeley last October and Long Beach last month before losing in the first round of the main draw each time. "It's fun," Brooksby, a home-schooled sophomore in high school, said of playing in pro tournaments. "It's good to compete against pros and see where you need to get." The biggest difference between the pros and juniors, according to Brooksby, is that the pros "won't give you any points. You have to earn everything." Brooksby broke Ton, a 5-foot-6 (1.68-meter) left-hander, in the last game of the first set before dominating with his impeccable groundstrokes. "I knew Andrew's game pretty well in advance," said Brooksby, estimating that he has played Ton five times, with mixed results, "but I felt I was hitting pretty big, running him off the court and backing him off the baseline. I knew he likes to come to the net a lot, so I was able to keep him back. I think I have the advantage there." Ton said his serve let him down in the match. "I've been a little injured the last couple days. That can't be an excuse. He played well, but I think it came down to the serve in the second set. The first set was really tight. Then in the second set, my serve just wasn't there," Ton admitted. Ton will play at Navy in Annapolis, Md., beginning in the fall, following in the footsteps of his 25-year-old sister Stephanie. "I wanted to get a great education while getting good competition in college tennis," Andrew explained. "I was also looking at the coaching staff and team. I wanted a place where they'll help me grow not only as a tennis player but as a person, and I've always wanted to serve my country. It's kind of been in my blood." Whether pro tennis is in Will's blood remains to be seen. Jenson (J.T.) Brooksby hits with assistant coach Anton Stryhas several times a week at the JMG Tennis Academy at the Arden Hills Club & Spa in Sacramento. They met Saturday in the men's open quarterfinals of the $2,500 Rio del Oro Open/Senior/NTRP tournament. Brooksby, seeded second and ranked No. 2 nationally in the 16-and-unders, outslugged Stryhas, seeded fifth, 6-3, 6-1 at the Rio del Oro Racquet Club in Sacramento. Brooksby, a 16-year-old Carmichael resident who trains under JMG director Joseph Gilbert, reached the 16-and-under final in the USTA National Championships in Kalamazoo, Mich., and the USTA National Clay Court Championships in Delray Beach, Fla., last summer. He won the 12-and-under title in the 2013 USTA National Championships in Little Rock, Ark. Stryhas, a Belarus native who lives in Fair Oaks, was named the 2008 Big Sky Conference MVP as a sophomore at Sacramento State. Brooksby will face ninth-seeded Karl Lee, an eighth-grader from Los Altos who also trains at JMG, today at 8 a.m. Lee outlasted Eric Hadigian, also seeded ninth, from Sacramento 6-7 (3), 6-4, 6-4. In the other semifinal at 8 a.m., fourth-seeded Andrew Ton of Milpitas will play unseeded Tam Duong of Rancho Cordova. The women's open semis also are scheduled for 8 a.m. No. 1 seed Allie Will of Modesto will meet No. 4 Madeline Almeida of El Dorado Hills, and No. 3 Muskan Mahajan of San Ramon will take on unseeded Klara Kosan of Carmichael. Will led Florida to the NCAA title in 2011 and 2012. She played briefly on the pro tour, reaching career highs of No. 280 in singles in 2013 and No. 98 in doubles in 2014. The men's and women's open singles finals are set for today at 11 a.m. Between them, Eric Johnson and Allie Will won five NCAA team titles. They are seeded first in the men's and women's open divisions, respectively, in the $2,500 Rio del Oro Open/Senior/NTRP tournament, which began Friday and concludes Sunday at the Rio del Oro Racquet in Sacramento. Both Johnson, who helped USC win three NCAA championships (2012-14), and Will, who led Florida to NCAA crowns in 2011 and 2012, received first-round byes. But Johnson, from San Jose, did not show up for his second-round match and defaulted to Tam Duong of Rancho Cordova. Will, who lives in Modesto, is scheduled to open against Maria Gonzalez of Sacramento today at 8 a.m. in the round of 16. Carmichael's Jenson Brooksby, ranked No. 2 nationally in the 16-and-unders, is seeded second in the men's open draw. He is scheduled to meet ninth-seeded Stevie Gould of Corte Madera in the San Francisco Bay Area today at 8 a.m. in the round of 16. The men's and women's singles quarterfinals are set for today at 11 a.m., the semifinals for Sunday at 8 a.m. and the finals for Sunday at 11 a.m.
CiCi Bellis' decision to turn pro last September is looking pretty good. The 17-year-old San Francisco Bay Area product earned her first victory over a top-10 player today, ousting Agnieszka Radwanska, seeded fourth and ranked sixth, 6-4, 2-6, 6-2 to reach the quarterfinals of the Dubai Duty Free Tennis Championships. "It's one of the best feelings in my life, for sure," Bellis, the youngest player in the top 100 at No. 70, gushed in her post-match news conference. "I'm really happy about the outcome tonight. I work so hard for it, and I think my work is paying off. I'm definitely playing some of my best tennis right now." Bellis, now based in Orlando, Fla., has won 21 of 23 matches since she turned pro after reaching the third round of the U.S. Open as a qualifier. "I have had kind of a dream couple of months since I have turned pro," said Bellis, who nonetheless missed January with strained hamstring and gluteus muscles. "Obviously it's not always going to be happy-go-lucky, but I have been really lucky so far. "I'm really just enjoying it more just thinking about how much fun I'm having and what an experience it's been for me so far." Bellis had not won a set in three matches against top-10 players. She lost to then-No. 1 Serena Williams 6-1, 6-1 in the third round in Miami in 2015, No. 7 Venus Williams 6-4, 6-1 in the Stanford quarterfinals last July and No. 2 Angelique Kerber 6-1, 6-1 in the third round of the U.S. Open last September. Radwanska reached the 2012 Wimbledon final to climb to a career-high No. 2 in the world. She is the second Grand Slam runner-up whom Bellis has beaten. Bellis burst onto the scene at 15 by stunning Dominika Cibulkova, seeded 12th and ranked 13th at the time, in the first round of the 2014 U.S. Open. Cibulkova had advanced to the Australian Open final that year. Bellis also has defeated two players, Shelby Rogers and Zhang Shuai, who have reached Grand Slam quarterfinals. Radwanska, the 2012 Dubai champion, finished with three aces and six double faults against Bellis and had a higher first-serve percentage (62) than her opponent (58). Bellis, meanwhile, actually won a higher percentage of points on her second serve (64) than her first (61). Moaned Radwanska: "I didn't feel good from the beginning. I didn't play really great, and I was trying everything. I did what I could today. For me, it was really hard to control the ball and make the angles. Also, my serve didn't work at all. "In those kind of tight matches, you need those things. When you don't have it and you're struggling pretty much from the beginning, then you have a problem. I was really struggling. I was really focusing on myself today, but I just wasn't good enough." Radwanska described Bellis as "very solid. Very consistent. She can really play good rallies with good intensity, and I think that's a really good thing for that kind of young player. I think she was the best today." Bellis' victory was all the more surprising because she had needed 2 hours, 22 minutes to subdue Laura Siegemund of Germany 7-5, 7-6 (3) on Tuesday. Radwanska, meanwhile, had dismissed qualifier Elise Mertens of Belgium 6-3, 6-2. Bellis is scheduled to face 10th-seeded Caroline Wozniacki, a former world No. 1 and two-time U.S. Open runner-up, for the first time on Thursday at 7 p.m. (7 a.m. California time). Live scoring will be available. Wozniacki, ranked 15th, defeated Kateryna Bondarenko of Ukraine 3-6, 6-2, 6-3. Bellis is projected to crack the top 60 with a loss to Wozniacki and the top 50 with a win. Now that beating top-50 players has become routine for CiCi Bellis, the 17-year-old San Francisco Bay Area product will try to take the next step in her blossoming career. Bellis, the youngest player in the top 100 at No. 70, held off No. 41 Laura Siegemund of Germany 7-5, 7-6 (3) in 2 hours, 22 minutes today in the second round of the Dubai Duty Free Tennis Championships. Bellis saved 12 of 18 break points against her versus 12 of 19 for Siegemund, who committed seven double faults. Siegemund, who will turn 29 on March 4, is the seventh top-50 player Bellis has beaten and the second in two days. She toppled Kazakhstan's Yulia Putintseva, seeded 17th and ranked 27th, 6-1, 7-5 in the first round. Bellis, who grew up in Atherton but now is based in Orlando, Fla., has won 18 of her last 19 matches. She ended 2016 with titles in two $50,000 indoor tournaments in Canada and the inaugural $125,000 Hawaii Open in Honolulu. Bellis is scheduled to face Agnieszka Radwanska, seeded fourth and ranked sixth, for the first time in Wednesday's featured night match at 7 o'clock (7 a.m. California time). Live scoring will be available. Radwanska dismissed qualifier Elise Mertens of Belgium 6-3, 6-2 after receiving a first-round bye. Bellis has not won a set in three matches against top-10 players. She lost to then-No. 1 Serena Williams 6-1, 6-1 in the third round at Miami in 2015, No. 7 Venus Williams 6-4, 6-1 in the Stanford quarterfinals last July and No. 2 Angelique Kerber 6-1, 6-1 in the third round of the U.S. Open last September. Entering Dubai, Siegemund had lost in the first round of seven straight tournaments after a sensational summer. In consecutive tourneys, she reached the semifinals in Bucharest on clay, won her first career WTA singles title in Bastad on clay and advanced to the Olympic quarterfinals in Rio de Janeiro on hardcourts. Siegemund also reached the Stuttgart final on indoor clay last April as a qualifier, defeating then-No. 2 Radwanska in the semifinals. finals of the $75,000 Tempe (Ariz.) Challenger. The singles champion of the $75,000 Tempe (Ariz.) Challenger still hasn't been decided. But it won't be Dennis Novikov. The 23-year-old resident of Milpitas in the San Francisco Bay Area lost to compatriot Tennys Sandgren 4-6, 6-4, 6-3 in today's semifinals. The unseeded Sandgren, 25, blasted 16 aces, committed four double faults and saved eight of 12 break points against him. The seventh-seeded Novikov had four aces and one double fault. He survived eight of 14 break points. Novikov ousted top-seeded Ernesto Escobedo of West Covina in the Los Angeles region in the quarterfinals. The Sandgren-Novikov match was delayed for several hours and suspended briefly early in the third set because of rain, forcing the final to be postponed until Monday. Sandgren, 25, will play unseeded Serbian Nikola Milojevic, who beat sixth-seeded Teymuraz Gabashvili of Russia 7-6 (3), 6-4. College -- No. 1-ranked Virginia, led by Collin Altamirano of Sacramento and playing at home, crushed No. 5 North Carolina 4-0 to reach the final of the ITA National Men's Team Indoor Championships in Charlottesville, Va. The two-time defending NCAA champion Cavaliers have shut out all three of their opponents in the tournament. Altamirano, a junior, dominated 16th-ranked Ronnie Schneider 6-0, 6-3 on Court 1 as Virginia avenged a 4-2 loss to the Tar Heels in last year's final. Altamirano also won at No. 3 doubles with J.C. Aragone. Although Altamirano is unranked in college, he's No. 813 in the world after reaching the quarterfinals and final in back-to-back $25,000 tournaments in Southern California last month. Virginia (8-0) will play No. 3-ranked Ohio State (12-0) for the title. Second-ranked Mikael Torpegaard lifted the Buckeyes to a 4-3 victory over No. 2 Wake Forest by edging top-ranked Petros Chrysochos 7-6 (6), 5-7, 7-6 (4) on Court 1. The Virginia and UCLA men's teams are both ranked in the top 10 with a Northern Californian in the singles lineup. But it was no contest when the No. 1 Cavaliers and the co-No. 7 Bruins met today in the quarterfinals of the ITA National Men's Team Indoor Championships. Virginia, the host and two-time defending NCAA champion, routed UCLA 4-0 in Charlottesville, Va. The Cavaliers' Collin Altamirano, a junior from Sacramento, and the Bruins' Logan Staggs, a 5-foot-9 (1.75-meter) junior from Tracy, trailed when their matches were abandoned. Martin Redlicki, ranked 73rd, led Altamirano 6-3, 4-2 on Court 1, and Alexander Ritschard was ahead of Staggs 7-5, 1-1 on Court 5. Altamirano won in doubles on Court 3 with J.C. Aragone. Staggs did not play doubles. Virginia will face defending champion and No. 5-ranked North Carolina, which defeated No. 4 Cal 4-2, in a rematch of last year's final. Bears junior Billy Griffith, a Fresno resident ranked 40th, lost to Robert Kelly 6-4, 4-6, 6-2 on Court 4 but won in doubles with Andre Goransson on Court 2. Cal's J.T. Nishimura, a junior from San Jose, trailed in doubles on Court 3 with Bjorn Hoffmann when their match was abandoned. Nishimura did not play singles. Men's Challenger -- Rain wiped out play in the $75,000 Tempe (Ariz.) Challenger. The singles semifinals and final and the doubles final are scheduled for Sunday. In the first singles semifinal, No. 7 seed Dennis Novikov of Milpitas in the San Francisco Bay Area will meet unseeded countryman Tennys Sandgren for the first time. After the doubles final, sixth-seeded Teymuraz Gabashvili of Russia will play unseededNikola Milojevic of Serbia. Novikov ousted No. 1 seed Ernesto Escobedo of West Covina in the Los Angeles area in the quarterfinals. No. 7 seed Dennis Novikov of Milpitas in the San Francisco Bay Area knocked off No. 1 Ernesto Escobedo of West Covina in the Los Angeles region 6-4, 6-7 (3), 6-4 today in the quarterfinals of the $75,000 Tempe (Ariz.) Challenger. Novikov, 23, saved both break points against him, blasted 10 aces and committed only one double fault. Escobedo, 20, had 13 aces and eight double faults. Novikov, ranked No. 179, will meet unseeded countryman Tennys Sandgren, ranked No. 198, for the first time on Saturday. Sandgren, 25, ousted No. 5 seed Marco Trungelliti of Argentina 6-3, 7-5. In the other semifinal, sixth-seeded Teymuraz Gabashvili of Russia will play unseeded Nikola Milojevic of Serbia. Denys Molchanov of Ukraine and Novikov, seeded first in doubles, lost to unseeded Marcelo Arevalo of El Salvador and Jose Hernandez-Fernandez of the Dominican Republic 2-6, 6-3 [12-10] in the semifinals. College -- No. 1 seed and host Virginia, the two-time defending NCAA champion, blitzed No. 16 Utah State 4-0 in the first round of the ITA National Men's Team Indoor Championships in Charlottesville, Va.
Collin Altamirano, a junior from Sacramento, led Jack Swindells 6-1, 4-3 on Court 1 when the match was abandoned. Altamirano and J.C. Aragone won in doubles on Court 3. The Cavaliers will play No. 8 UCLA, which edged No. 9 USC 4-3, in Saturday's quarterfinals. The Bruins' Logan Staggs, a junior from Tracy, lost to 119th-ranked Jack Jaede of the Trojans on Court 5 to tie the score 3-3. Martin Redlicki, ranked 73rd, won the deciding match on Court 1. Staggs did not play doubles. No. 4 Cal, with Billy Griffith of Fresno and J.T. Nishimura of San Jose, beat No. 13 Baylor 4-2. Griffth, ranked 40th, routed Jimmy Bendeck 6-1, 6-2 on Court 4. Nishimura lost to Constantin Frantzen 7-6 (4), 6-3 on Court 6. Griffith won on Court 2 in doubles, but Nishimura lost on Court 3. The Bears will face No. 4 seed and defending champion North Carolina, which topped No. 12 Georgia 4-2. In the ITA National Women's Indoor Championships in New Haven, Conn., No. 1 seed Florida defeated North Carolina 4-2 on Monday for the title. No. 7 Cal lost to the Tar Heels 4-2 in the quarterfinals. Texas Tech's Felicity Maltby, a sophomore from Sunnyvale, was named to the all-tournament team at No. 3 doubles with junior Gabriela Talaba. They went 2-0. No. 29 (-2) -- Sam Querrey, 29-year-old San Francisco native. No. 179 (-1) -- Dennis Novikov, 23-year-old resident of Milpitas in San Francisco Bay Area. No. 258 (career high, +8) -- Mackenzie McDonald, 21-year-old product of Piedmont in San Francisco Bay Area. No. 720 (-3) -- Ryan Haviland, 36-year-old former Stanford All-American. No. 764 (-2) -- Bradley Klahn, 26-year-old former NCAA singles champion from Stanford. No. 810 (-5) -- John Lamble, 24-year-old Saratoga resident and former Santa Clara star. No. 813 (-4) -- Collin Altamirano, 21-year-old Sacramento native and resident. No. 865 (-4) -- Connor Farren, 22-year-old product former USC standout from Hillsborough in San Francisco Bay Area. No. 60 (-2) -- Scott Lipsky, 35-year-old former Stanford All-American. No. 95 (-20) -- Sam Querrey, 29-year-old San Francisco native. No. 159 (-1) -- Dennis Novikov, 23-year-old resident of Milpitas in San Francisco Bay Area. No. 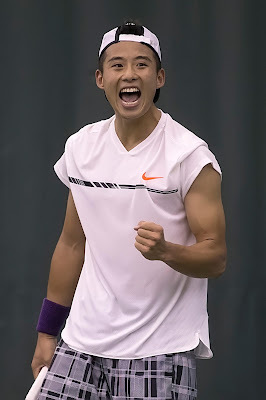 268 (-1) -- Mackenzie McDonald, 21-year-old product of Piedmont in San Francisco Bay Area. No. 395 (+19) -- John Paul Fruttero, 35-year-old former Cal All-American. No. 539 (-2) -- John Lamble, 24-year-old Saratoga resident and former Santa Clara star. No. 709 (+117) -- Bradley Klahn, 26-year-old former NCAA singles champion from Stanford. No. 52 (-1) -- Sloane Stephens, 23-year-old Fresno product. No. 73 (no change) -- CiCi Bellis, 17-year-old product of Atherton in San Francisco Bay Area. No. 88 (+2) -- Nicole Gibbs, 23-year-old former NCAA singles and doubles champion from Stanford..
No. 222 (+5) -- Kristie Ahn, 24-year-old former Stanford All-American. No. 414 (-1) -- Maria Sanchez, 27-year-old Modesto product. No. 510 (no change) -- Carol Zhao, 21-year-old former Stanford star. No. 710 (+1) -- Michaela Gordon, 17-year-old resident of Saratoga in San Francisco Bay Area. No. 20 (no change) -- Raquel Atawo (formerly Kops-Jones), 34-year-old San Jose resident and 2003 NCAA doubles champion from Cal. No. 61 (no change) -- Maria Sanchez, 27-year-old Modesto product. No. 162 (+1) -- Nicole Gibbs, 23-year-old former NCAA singles and doubles champion from Stanford. No. 331 (-4) -- Carol Zhao, 21-year-old former Stanford star. No. 403 (-1) -- Kristie Ahn, 24-year-old former Stanford All-American. No. 440 (no change) -- CiCi Bellis, 17-year-old product of Atherton in San Francisco Bay Area. No. 604 (+2) -- Maegan Manasse, 21-year-old Cal senior. No. 707 (+4) -- Felicity Maltby, 19-year-old Sunnyvale resident. No. 726 (+4) -- Alexandra Facey, 24-year-old product of Cameron Park in Sacramento area. No. 726 (+4) -- Kat Facey, 24-year-old product of Cameron Park in Sacramento area. No. 732 (+4) -- Michaela Gordon, 17-year-old resident of Saratoga in San Francisco Bay Area. No. 885 (-3) -- Sloane Stephens, 23-year-old Fresno product. Rotterdam (men), early rounds, 2:30 p.m. (taped). Rotterdam/Buenos Aires (men), early rounds, 7 p.m. (taped). Rotterdam (men), quarterfinals, 3:30 a.m. (live). Memphis (men), quarterfinals, 2:30 p.m. (live). Rotterdam/Buenos Aires/Memphis (men), quarterfinals, 10 p.m. (taped). Rotterdam (men), semifinals, 6 a.m. (live), 4 p.m. (taped). Memphis (men), semifinals, 2 and 5:30 p.m. (live). Rotterdam/Memphis (men), semifinals, 7:30 p.m. (taped). Rotterdam (men), final, 6:30 a.m. (live). Rotterdam/Buenos Aires, finals, 9 a.m.
Memphis (men), final, 1 p.m. (live). Rotterdam/Buenos Aires/Memphis (men), finals, 3:30 and 11:30 p.m. (taped). Friday-Monday -- Intercollegiate Tennis Association National Men's Team Indoor Championships, Charlottesville, Va. When tennis was readmitted to the Olympics in 1988, China began pouring resources into the sport. It has paid off handsomely on the women's side. China's success started with Li Ting and Sun Tian Tian, who won the doubles gold medal in the 2004 Olympics in Athens. Then Yan Zi and Zheng Jie captured the Australian Open and Wimbledon doubles titles in 2006. But Li Na made the biggest splash by winning the French Open singles title in the 2011 and adding the 2014 Australian Open crown. Irreverence added to her appeal, and the tennis world mourned when she retired only nine months after the Melbourne title at age 32. Also, Peng Shuai won the 2013 Wimbledon and 2014 French Open doubles titles with Hsieh Su-Wei of Taiwan. Zhang defeated Pospisil 7-5, 3-6, 6-2 in 2 hours, 21 minutes. No Chinese men have made a big impact in singles or doubles, but in a nation of 1.38 billion people (18.7 percent of the world's population), it could be only a matter of time until that happens. 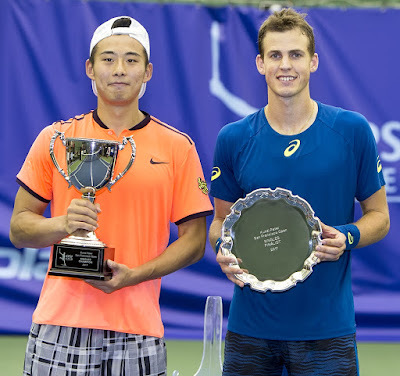 China, which has six WTA and four ATP tournaments, took another step in that direction on Sunday when qualifier Zhang Ze subdued seventh-seeded Vasek Pospisil of Canada 7-5, 3-6, 6-2 in 2 hours, 21 minutes to win the $100,000 KPSF Open indoors at the Bay Club SF Tennis Center. Both players are 26. After Pospisil sailed a forehand long on Zhang's first championship point, Zhang joyously fell on his back and put his head in his hands in disbelief. Zhang, 6-foot-2 (1.88 meters), became the first qualifier of the year and second Chinese man ever to win a Challenger singles title. Wu Di took the Maui crown in January 2016. Zhang had been 0-3 in Challenger finals. Whereas China has five women in the singles top 100, Zhang leads his countrymen at No. 158. "Chinese men improve a lot, but (we're) not great," Zhang, who soared 37 places with the title, conceded earlier in the week. "We try." The 6-foot-4 (1.93-meter) Pospisil, who was treated for a leg injury in the third set, was one of three seeds defeated by Zhang. He shocked No. 2 Taylor Fritz, a 19-year-old American, in the first round and knocked off No. 5 Henri Laaksonen of Switzerland in the semifinals. Pospisil ascended to a career-high No. 25 in 2014, won the Wimbledon men's doubles title with Jack Sock later that year and reached the Wimbledon singles quarterfinals in 2015. But after plunging from No. 39 to No. 112 last year, Pospisil parted ways with coach Frederic Fontang and hired Mark Woodforde, an International Tennis Hall of Famer who won 12 Grand Slam men's doubles titles (including a record six at Wimbledon). Pospisil, ranked No. 131 entering San Francisco, rose to No. 118. Pospisil had combined for 21 aces and one double fault in 56-minute victories over 19-year-old Americans Frances Tiafoe, seeded first, in the quarterfinals and unseeded Michael Mmoh in the semifinals. But in the final, Pospisil had six aces and six double faults, put in only 52 percent of his first serves and saved nine of 14 break points. 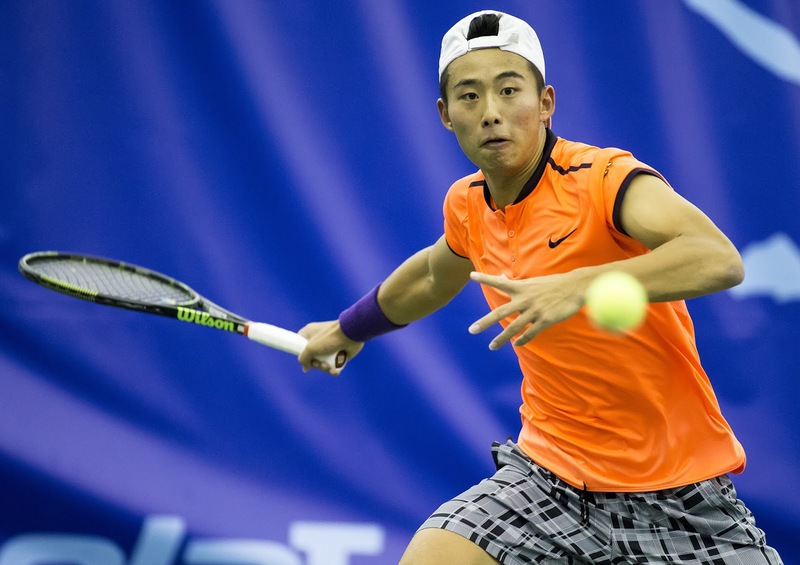 Zhang also had six aces but committed only three double faults, converted 67 percent of his first deliveries and saved three of six break points. Zhang overcame a 4-1 deficit in the first set of the final and broke for 4-2 in the second set on a putaway backhand volley set up by a punishing forehand down the line. Zhang held at love for 5-2 and earned a break point when Pospisil slugged a cross-court backhand wide. Pospisil then missed his first serve before committing the forehand error for the match. Zhang almost swept the singles and doubles titles. No. 1 seeds Matt Reid and John-Patrick Smith of Australia edged No. 2 Gong Mao-Xin and Zhang 6-7 (4), 7-5 [10-7]. Here are the completed KPSF Open singles and doubles draws. Chinese qualifier Ze Zhang pulled off another upset Saturday to reach the final of the $100,000 KPSF Open in San Francisco. Zhang, who stunned No. 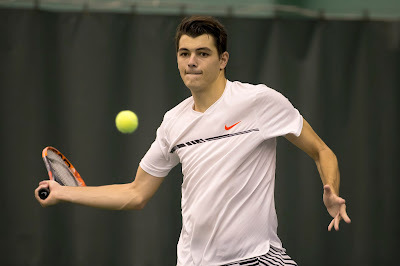 2 seed Taylor Fritz in the first round, defeated No. 5 Henri Laaksonen of Switzerland 6-4, 7-6 (7) indoors at the Bay Club SF Tennis Center. Zhang will face red-hot Vasek Pospisil, seeded seventh, for the first time today at 2 p.m. Zhang then will play in the doubles final. Both matches will be streamed live. Pospisil dismissed a 19-year-old American sensation in 56 minutes for the second straight day, routing Michael Mmoh 6-1, 6-2. Pospisil avenged a 3-6, 6-4, 6-3 loss to Mmoh in the first round of the $75,000 Maui Challenger two weeks ago in their first meeting. After beating top-seeded Frances Tiafoe 6-1, 6-4 on Friday, the 6-foot-4 (1.93-meter) Pospisil won 23 of 26 points (88 percent) on his first serve and saved all four break points against him. The Canadian had seven aces and one double fault, bringing his two-day totals to 21 and one, respectively. The 6-foot-2 (1.88-meter) Zhang had similar statistics against Laaksonen, winning 33 of 40 points (83 percent) on his first serve and saving two of three break points against him. He had seven aces and four double faults. Both Pospisil, ranked No. 131, and Zhang, ranked No. 195, are 26. Posipsil, who reached No. 25 and won the Wimbledon men's doubles title with Jack Sock in 2014, seeks his fifth Challenger singles title. Zhang is 0-3 in Challenger finals. Here are the KPSF Open singles and doubles draws and today's schedule. A 19-year-old American reached the semifinals of the $100,000 KPSF Open in San Francisco, but it's not the top seed. Unseeded Michael Mmoh beat countryman Denis Kudla, seeded eighth, 2-6, 6-3, 6-4 indoors on Friday at the Bay Club SF Tennis Center. Mmoh trailed 4-2 in the third set. No. 7 seed Vasek Pospisil showed the form that took him to No. 25 in the world three years ago, downing Mmoh's best friend, No. 1 Frances Tiafoe, 6-1, 6-4 in 56 minutes. Both matches were first-time encounters. That will not be the case when Pospisil and Mmoh meet tonight at 7. Live streaming is available. Mmoh defeated Pospisil, a 26-year-old Canadian, 3-6, 6-4, 6-3 in the first round of the $75,000 Maui Challenger two weeks ago en route to the quarterfinals. This will be the second meeting between Pospisil, ranked No. 131, and Mmoh, ranked No. 193. In the bottom half of the draw, fifth-seeded Henri Laaksonen of Switzerland and qualifier Ze Zhang of China advanced with straight-set victories. In the opening round, Zhang shocked second-seeded Taylor Fritz, another 19-year-old American. Laaksonen, 24, and Zhang, 26, will meet for the first time. They are ranked No. 124 and No. 195, respectively. Pospisil, 6-foot-4 (1.93 meters), blasted 14 aces, committed no double faults and did not face a break point against Tiafoe. Pospisil won 24 of 29 points (83 percent) on his first serve and 12 of 16 (75 percent) on his second delivery. Here are the KSPF Open singles and doubles draws and today's schedule. Vasek Pospisil shouldn't be playing a Challenger in San Francisco this week. --Ascended to No. 25 in the world three years ago at age 23. --Reached the Wimbledon singles quarterfinals in 2015. --Won the Wimbledon men's doubles title with Jack Sock in 2014. --Helped Canada advance to the Davis Cup semifinals in 2013. Alas, the 6-foot-4 (1.93-meter) Pospisil has plunged to No. 133. Hello, San Francisco, where Pospisil is joined by recently hired coach Mark Woodforde, a Hall of Fame doubles legend. 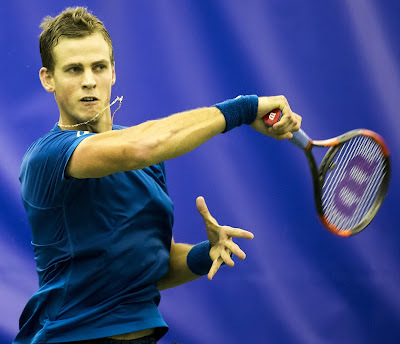 Pospisil, seeded seventh in the $100,000 KPSF Open, on Thursday prevented an all-American sweep of the quarterfinal berths in the top half of the draw. Pospisil defeated 19-year-old Reilly Opelka, 6-foot-11 (2.11 meters), 6-7 (5), 6-1, 6-3 indoors at the Bay Club SF Tennis Center to set up a tantalizing first-time meeting with top-seeded Frances Tiafoe tonight after a 7 o'clock doubles match. Tiafoe, also 19, is the youngest player in the top 100 at No. 94 and the only player in the draw to reach the second round of the Australian Open last month. Pospisil lost in the first round of qualifying in Melbourne. Opelka stunned then-No. 28 Kevin Anderson en route to the semifinals in Atlanta on the ATP World Tour last August. $100,000 Fairfield (Calif.) Challenger last October. Also in the top half of the KPSF Open draw, eighth-seeded Denis Kudla will take on yet another 19-year-old sensation, Michael Mmoh, for the first time at about 4 p.m.
Kudla, 24, seeks his third Challenger semifinal of the year and second in two weeks. He fell to Taylor Fritz, still another 19-year U.S. prospect, 7-6 in the third set in last week's $125,000 Dallas Challenger. Mmoh, the Saudi Arabia-born son of Nigeria native and former journeyman pro Tony Mmoh, ousted third-seeded Mikhail Kukushkin of Kazakhstan on Wednesday for his first victory over a current top-100 player. Mmoh defeated Pospisil two weeks ago in the first round of the $75,000 Maui Challenger en route to the quarterfinals. Only one seed and one American remain in the bottom half of the KPSF Open draw, and they will meet after the Kudla-Mmoh encounter. Fifth-seeded Henri Laaksonen of Switzerland will face qualifier Eric Quigley. 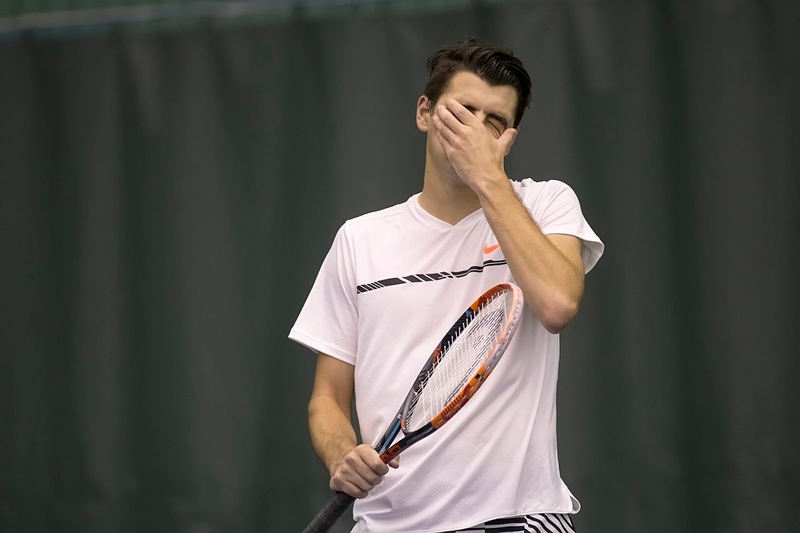 Laaksonen reached the semifinals of the Maui Challenger and played on the Swiss Davis Cup team that lost to the United States 5-0 last week in Birmingham, Ala. Swiss stars Roger Federer and Stan Wawrinka skipped the first-round series. Quigley reached the NCAA singles final in 2012 as a senior at the University of Kentucky, losing to Steve Johnson of USC, and advanced to the semis of the $100,000 Aptos Challenger as a qualifier last August. Aptos is a 90-minute drive south of San Francisco on the Pacific Ocean. At 2 p.m. today, Tatsuma Ito of Japan will play qualifier Ze Zhang of China. Ito, a Dallas semifinalist, upset sixth-seeded Peter Polansky of Canada 7-6 (3), 3-6, 6-4. Zhang topped qualifier Brayden Schnur of Canada 6-4, 6-2 after the ousting second-seeded Fritz in the first round. SAN FRANCISCO -- Only 19 years old, Michael Mmoh of the United States has played in the main draw of the last two Grand Slam tournaments. He has won a Challenger singles title. He has beaten past or future top-100 players. But until Wednesday, he had not defeated anyone currently in the top 100. 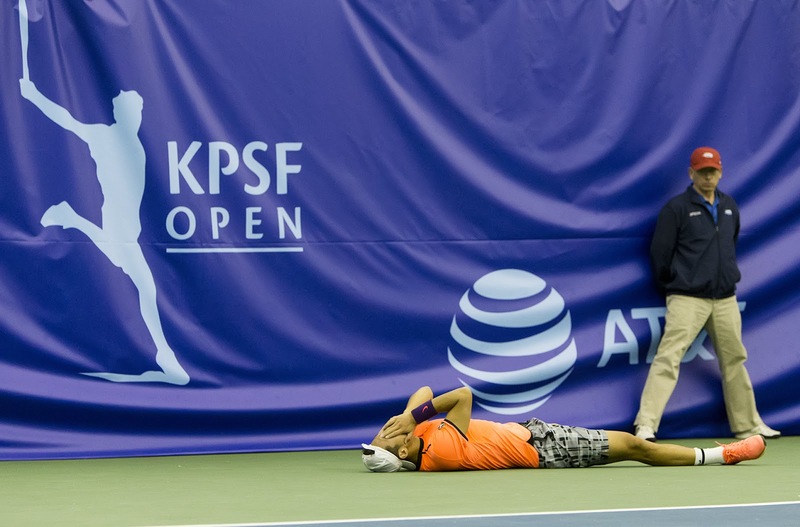 Taking the latest step in his promising career, Mmoh upset third-seeded Mikhail Kukushkin of Kazakhstan 6-3, 6-3 to reach the quarterfinals of the $100,000 KPSF Open indoors at the Bay Club SF Tennis Center. Kukushkin is 10 years older than Mmoh and ranked 100 places higher at No. 93. "This is my first win where the guy was actually top 100 when I played him, so I'm very happy to come away with the win, especially 3 and 3," Mmoh said. "I think that sends a message and gives me a lot of confidence going on to the rest of the year." Mmoh kept balls in play with his breathtaking athleticism, which has been compared to that of ninth-ranked Gael Monfils, until Kukushkin made an error. Mmoh, powerfully built at 6-foot-1 (1.85 meters), often leaps into his shots and almost does the splits retrieving balls with his two-handed backhand. Mmoh, who was born in Saudi Arabia to Nigeria native and ex-journeyman pro Tony Mmoh and an Irish mother who also holds Australian citizenship, acknowledged that defense "has always been a key to my success. I'm really athletic. It's very tough to get the ball by me. I'm going to make you play. You're going to have to hit maybe five winners to win the point. "Right now, I'm just working on being more aggressive because I've always had the athleticism. I've always had the ability to get balls back, balls that 98 percent of people might not be able to get. I need to become a more complete player, and I think today I was hitting the ball. I was going after it. It was a good balance." While crediting Mmoh, Kukushkin said he wasn't himself. "Mmoh played really well today," conceded Kukushkin, a slender 6-foot (1.83-meter) Russia native. "He's a young guy, he was serving well, moving well, playing a lot of good balls and playing aggressive. He deserved to win. I was not in my best shape today and was not able to show my aggressive play." After reaching a career-high No. 46 in October 2015, the right-handed Kukushkin was plagued by a right elbow injury throughout 2016 and tore a knee ligament at Wimbledon last year that did not require surgery. From last October until last week's $125,000 Dallas Challenger, he failed to win a match in six tournaments. "Still coming into this season, I didn't feel 100 percent," Kukushkin moaned, "so that's why I'm kind of struggling right now." Also Wednesday, the last three NCAA singles champions lost. Wild card Ryan Shane (2014, Virginia) fell to another 19-year-old U.S. sensation, top-seeded Frances Tiafoe, 7-6 (4), 6-7 (4), 6-2 in an all-Washington, D.C.-area second-round matchup. The 6-foot-4 (1.93-meter) Shane, 22, was born and resides in Falls Church, Va. Tiafoe, ranked No. 94, was born in Hyattsville, Md., to emigrants from Sierra Leone but trains in Orlando, Fla. Diminutive Marcos Giron (2015, UCLA) of Thousand Oaks in the Los Angeles area lost to fellow wild card Ramkumar Ramanathan of India 2-6, 6-4, 6-4 in the first round. And Mackenzie McDonald (2016, UCLA), who grew up in Piedmont across the bay from San Francisco, fell to eighth-seeded Denis Kudla of Arlington, Va., in the Washington, D.C., area and Tampa, Fla., 7-6 (5), 4-6, 6-2 in a second-round battle of undersized players. Kudla, 24, improved to 2-1 against McDonald, 21. All three matches have gone to three sets, and all have occurred in Northern California. "For sure, he'll be a top-100 player -- guarantee it -- so I knew it would be tough," said Kudla, who's ranked No. 127 after reaching a career-high No. 53 last May. "Both of us are playing great against each other. He got me last time, so I knew what to expect, I expected an extremely high level, and he brought it. "I made some improvements in my game the last couple months, since the last time we played. I think it definitely showed out there. I applied more pressure instead of the other way around and was dictating more." Kudla, who seeks his third Challenger semifinal of the year, elaborated on his improvements. "Just taking time away and hitting the ball bigger, being less predictable, tightening up on errors and consistency but not being a pusher," he said. "Being aggressive and taking the initiative, and I'm being successful at it right now." Pounding his groundstrokes into the corners, Kudla reeled off the last four games of the deciding set. "He played more aggressive for sure compared to last time," said the 266th-ranked McDonald, who turned pro last June after his junior year. "Maybe it was the indoor courts, but he's playing really well right now. Last time, I feel like he was just making a ton of balls and I was dictating a lot. But tonight, he was trying to dictate, too, so it made it tough." If 6-foot-11 (2.11-meter) Reilly Opelka, 19, upsets seventh-seeded Vasek Pospisil of Canada, a distinct possibility, in tonight's featured singles match, Americans will have swept the quarterfinal berths in the top half of the draw. Tiafoe will face Pospisil or Opelka, and Kudla will play Mmoh. In the bottom half, the only remaining American after the first round is qualifier Eric Quigley, and the only seeds left are No. 5 Henri Laaksonen of Switzerland and No. 6 Peter Polansky of Canada.